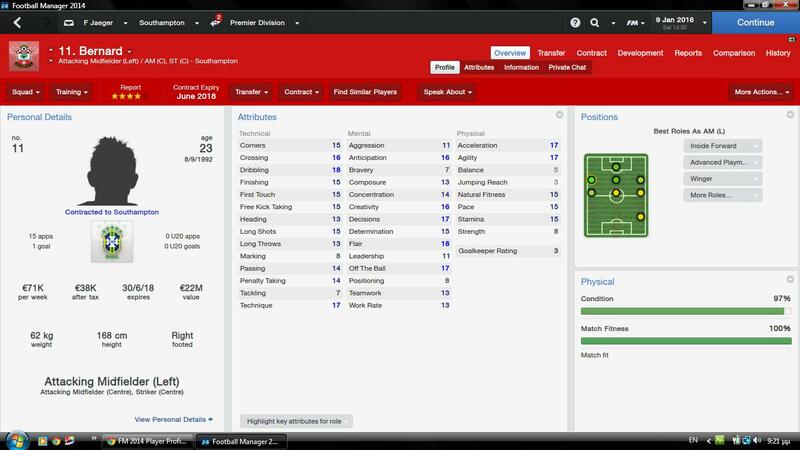 This FM 2014 Player Profile of Bernard shows a great talent for the wing. Fast, skillful and packing a great shot. You could use Bernard as inside forward and take advantage of his great finishing, but I’d suggest he can be just as successful in the role of winger. This kid has magical feet, great pace, flair and dribbling to make life tough for any defence. During our test save Bernard scored 45 goals in three seasons for Shakhtar before Norwich enjoyed some fine form. Unfortunately 40% of Bernard belongs to a third party, so you’ll have to pay them off on top of the asking price of £24 million. But there’s few better than this lad and he can develop beyond the screenshots shown above. Bernard Age: 20 Position: AML/AMC/ST Role: winger Club: Shakhtar Nationality: Brazilian Value: £9.75 million Price tag: £24 million (in patch 14.3) CA: 149 / PA: 170 Bernard profile in 2013 (after starting new game, 14.3) Bernard profile aged 27 in the year 2020 Bernard career history until 2020 This FM 2014 Player Profile of Bernard shows a great talent for the wing. Fast, skillful and packing a great shot. You could use Bernard as inside forward and take advantage of his great finishing, but I'd suggest he can be just as successful in the role of winger. This kid has magical feet, great pace, flair and dribbling to make life tough for any defence. During our test save Bernard scored 45 goals in three seasons for Shakhtar before Norwich enjoyed some fine form. Unfortunately 40% of Bernard belongs to a third party, so you'll have to pay them off on top of the asking price of £24 million. But there's few better than this lad and he can develop beyond the screenshots shown above. What’s with Norwich in these games? That seems to be everyones question, they had a rich takeover from what I remember. Wow, what an amazing player rating throughout his whole career, and I join the previous comments about the awe seeing what Norwich is doing, they are a force in later years it seems! Yeah he’s performed well and Norwich have a killer squad, yet haven’t won any silverware. He does have some Henry like attributes yes. Maybe, but SI are usually good judges of attributes. Darren who would you prefer on the left (AML) Draxlar or Bernard? I think he might be the best AML wonderkid ingame at the moment ,as far as inside forwards go. I’d agree with that, he is a really really good inside forward and can definitely do better than the screenshots above. Isn’t he very injury prone? No not really, I haven’t noticed that about him and looking in the editor he is below half the max for that attribute so I wouldn’t say he is injury prone. I’ve been looking to poach a winger from Shaktar and they have so many marvelous wonderkids!!! Who should I pick – Bernard, Wellington Nem, or Douglas Costa? With Liverpool I already have Insigne on my left wing and Suarez on my right wing. But I don’t have much behind them. If one gets tired, injured, or has a bad day, I’ve got no depth! I personally would go for Bernard, he’s a class above the rest.